With the election in our rear view mirror, and with additional data available from the State Board of Elections, we can now take a look at how the 16 localities – six counties and ten cities – that comprise Hampton Roads voted in November. 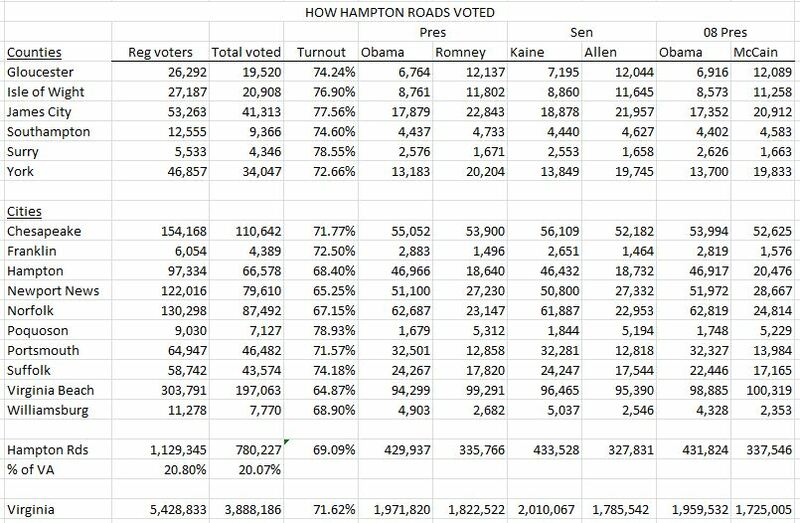 With 1,129,345 registered voters, Hampton Roads comprises nearly 21% of the electorate. Because our voter turnout lagged the state average – 69.09% versus 71.62% – our votes cast provided just over 20% of state total. Turnout in five cities fell below the state average, with Virginia Beach, at 64.87%, having the lowest. President Obama won the region. The statewide narrowing of the presidential race – Obama won Virginia by 234,527 votes in 2008 compared with only 149,298 in 2012 – is also reflected in the region: Obama received 1,887 fewer votes this cycle than last time. Note also that Mitt Romney received fewer votes this cycle – 1,780 – than John McCain did in 2008. Despite the lower totals, the president only lost two localities statewide that he won in 2008. Neither of them – King & Queen and Montgomery counties – are in Hampton Roads. In addition, the president actually received more overall votes statewide in 2012 than he did in 2008, but none of that growth in votes was in our region. Tim Kaine also won Hampton Roads – and did so with 3,591 more votes than Obama. Kaine also won Virginia by a larger margin than did Obama, a result which I think should have been expected. The data I used all came from the SBE. My spreadsheet is below (click to enlarge). I don’t know what is going on in Virginia Beach. There are still no numbers posted at http://www.vbgov.com/government/departments/voter-registrar/elections/Pages/elections-information-results.aspx And when the newspaper listed votes by precinct, my precinct was listed as 0. I have been checking the registrar’s site since, because I want to know that my precinct was counted. Have you looked at the SBE site? It has precinct totals. Do you think the shift in Virginia Beach was entirely reflective of the city’s demographics or do you think there’s something else going on? Going just on the Demographics, Virginia Beach is about as black as the Commonwealth at large (20.1% :: 19.8%), a little less Hispanic but not terribly so (7.0% :: 8.2%) and almost exactly as white/non-Hispanic (64.2% :: 64.5%). The annual per capita income is slightly lower than the Commonwealth’s ($31.6k :: $33.0k) and the median household income is slightly higher ($65.9 :: $63.3). Poverty rates are lower (7.1% versus 10.7%) but poverty levels are substantially lower than 7% in many counties that Obama won, and substantially higher than 10.7% in many counties that Romney won. Looking purely at the demographics, Virginia Beach is fairly representative of the state as a whole. Yet Obama won the state by about 4% and lost Virginia Beach by a little more than 3%. A natural conservative lean seems like an easy explanation, but Kaine won a majority of the vote on the same day, which suggests it’s not as simple as that. I don’t think it’s just demographics. The turnout numbers bother me. I wonder what was going on with the various campaigns’ field teams. I heard some…bizarre…rumors about VAB field operations specifically this year, but I don’t generally listen to rumors like that. Maybe there was some truth after all? Maybe. I wasn’t privy to the operations but the results aren’t good.